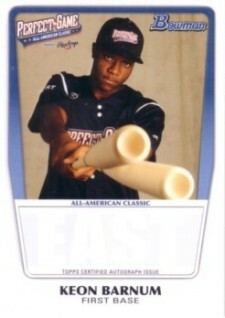 Although they're still in high school, 46 students have already gone through the rigors and routines of having their first baseball cards made, printed and autographed. 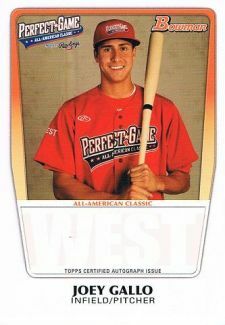 Topps was on hand at the Perfect Game All-American Baseball Classic this weekend in San Diego and photographed all the nearly 50 participating players. Within 24 hours, the company had the cards printed. Players were given their own personal copies and some were handed out to fans at the game. Participants also autographed copies for Topps that will be numbered, stamped and inserted in products in the years to come as the players go professional and sign contracts with the company. Cards given out at the game are selling briskly. One completed auction for all 46 cards went for $350 on eBay. It is worth noting that all cards were printed with the autograph in mind and include the note, "Topps Certified Autograph Issue." This should not imply authenticity as cards are readily available without the signature. Unfortunately, this could lead to forgeries down the road should any of the players become hot prospects or superstars. As mentioned, when the cards become available in packs, they'll have distinct numbering and foil to differentiate them. Collectors should be careful if they're buying non-numbered autographs in the years to come. Joey Gallo was the Most Valuable Player of the game. He smashed a monstrous 442-foot home run, the tenth longest in PETCO Park's history, in the second inning off Lucas Sims. Jesse Winker Auto. 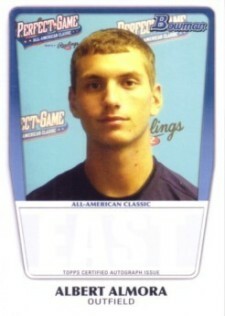 2011 Topps Bowman Perfect Game All American Rookie Autograph. Joey Gallo Rookie Auto. 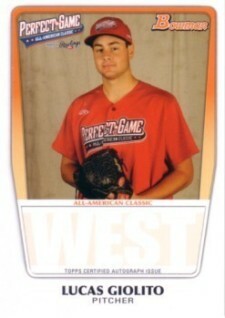 2011 Topps Bowman Perfect Game All American Autograph. Addison Russell Perfect Game Auto. 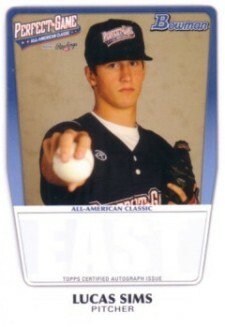 2011 Topps Bowman Rookie Autograph.